When I purchased the XL1201, it came with a Model 3600 keyboard. Unfortunately, several keys didn't work, including both hypers, and the left control and super. I disassembled it and couldn't see anything obvious wrong, so I assumed the key switches went bad. However, this keyboard uses hall effect switches, which have no electrical moving parts. (The keypress moves a magnet, which is sensed by an unmoving electrical component.) So, there aren't many things to break. I put it back together to deal with later. 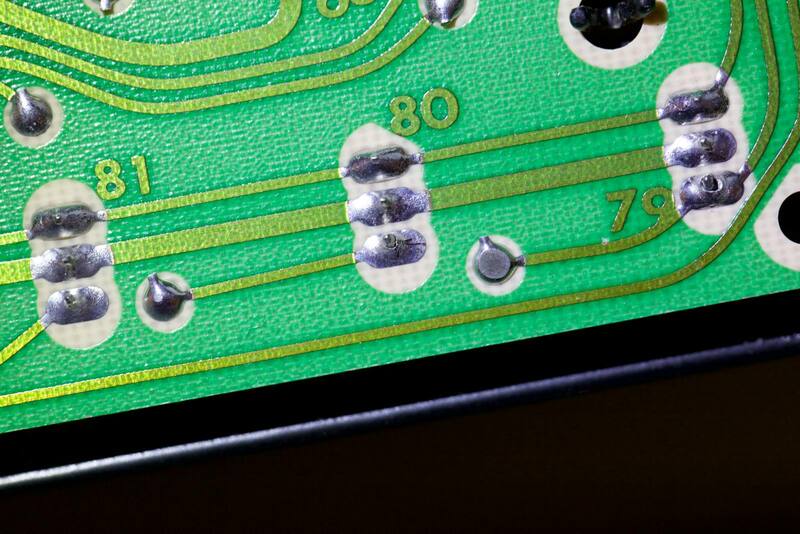 As you can see, the bottom solder joints for 79 and 80 are clearly suspect. 79 is the left hyper, and 80 is the left super. I broke out my loupe and flashlight and looked at each of the 88 keys. I found five obviously bad solder joints, all on the bottom row and bottom joint. I took out the Hakko and redid the five suspect joints, and tested the keyboard. The left hyper (key 79) was still intermittent and I re-examined the joint; my repair was bad. I wicked the solder and redid that joint and retested. Now I had a fully working Symbolics 3600 keyboard! Another minor thing to fix later: the two wood blocks with metal screw holes that were attached to the top side of the case have come unglued. I'll need to clean and re-glue these.